Lee este artículo en español en nuestra CTA Newsletter. Originally published in the December 2018 issue of the CTA Newsletter. 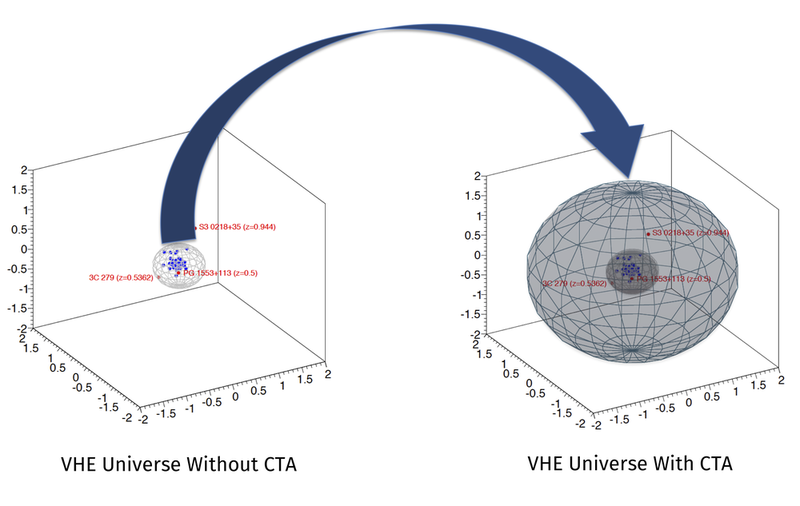 When we talk about CTA, we usually talk about studying the Universe at the highest energies. Scientists, however, also talk about low energies with CTA, which seems strange because those “low” energies are still a million times higher than the energy of X-rays. Therefore, it’s all a matter of perspective. The low energies from CTA’s perspective are those on the low edge (20 GeV to around 200 GeV) of its full energy range between 20 GeV and 300 TeV. Why are these low energies important and what do scientists hope to discover through their study? This is an overview of why scientists are scrambling to push for excellent sensitivity of CTA in this lower-energy band. 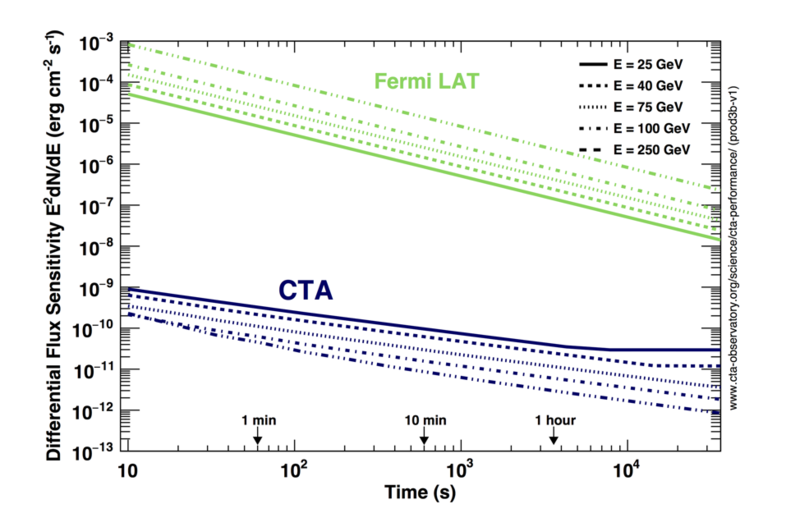 Figure 2: Comparison of CTA’s projected sensitivity and Fermi-LAT’s sensitivity at the same energies in the low-energy gamma-ray regime. CTA will not be the only instrument sensitive to low-energy gamma rays. Gamma-ray satellites like Fermi-LAT, for example, also can measure in this energy regime. However, because satellites have a small collection area (<1m2), they struggle to measure transient phenomena. CTA’s collection area will be about a million times larger, which results in a much-improved sensitivity on short timescales where the hadronic background is unimportant. Fig. 2 demonstrates that for every short-time phenomena (like a flare) with a duration of less than a day, CTA’s sensitivity is many orders of magnitude better than the satellite-based Fermi-LAT. This is extremely important as we expect many time-variable phenomena like flares of extragalactic sources (e.g. blazars and radio galaxies), as well as galactic transients (e.g. gamma-ray binaries and soft gamma-ray repeaters) to happen on time scales of hours and below. CTA will be opening a new window in the time domain for these gamma-ray energies.